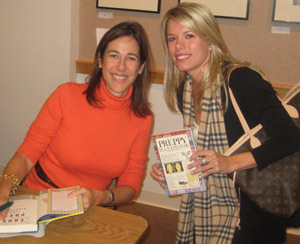 I went to see Lisa Birnbach speak last November on her True Prep book tour in New Canaan, CT. One of her anecdotes was about "mummy's" mid-life job crisis; she has moved on from real estate and is now pre-writing for her novel. "Being a pre-writer is a preppy career choice. Anyone can do it and it's good for corresponding with doers." Well I'm far from a mid-life crisis, but this struck a cord. 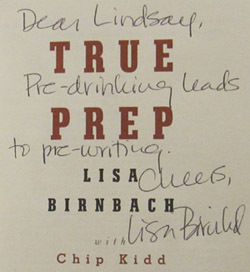 I joked with Ms. Birnbach afterward that I was doing some research and pre-writing for my non-existent blog. Had it not been for all of the hype of True Prep on my Google Reader I may not have attended. My daily reads have inspired me to buckle down and start my own. After all, I studied journalism and the only thing I have written besides emails and PowerPoint decks since college are Facebook posts. It just seems fitting. Finally, an outlet to chronicle my ventures, likes, dislikes and everything in between. True Prep & Official Preppy Handbook signed! I am thrilled that I helped inspire you in some small way.